Two cops in Illinois are being called heroes after they saved the life of a choking 19-month-old girl in an incident captured on videotape. Schaumburg Village Officers Bryan Poradzisz and Kevin O’Connor were responding to a call just around 9pm about a child in respiratory distress. The child’s grandmother had noticed that the girl stopped breathing. She stopped the car and called 911. By the time Poradzisz arrived, the child’s lips were blue and there weren’t many signs of life. Poradzisz gave the baby the Heimlich maneuver and CPR as O’Connor arrived on scene. After some vomit and mucous were cleared from the airway, the baby regained consciousness and made a full recovery. 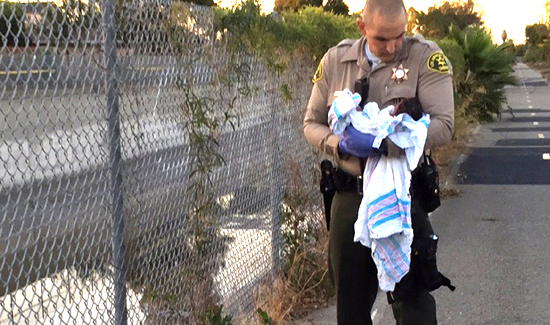 The officers stayed with the infant and the grandmother until paramedics arrived at the scene. The grandmother was blown away. “Just to know how quickly they got there and they were able to revive her, and the paramedics were right behind them,” Sonia Melendez told the Chicago Daily Herald. The internet was impressed too. “Want a definition of heroism? Here it is. Well done!! !” wrote one Facebook commenter. “Made me teary-eyed. God bless our police officers, fire fighters, and paramedics,” said another.